If I agree with the base sentiment, I sometimes share an idea in an effort to amplify it. If you’re doing the yeoman’s work of posting unpopular buzzkill news, I will like it, share it, and marry it. Sometimes this backfires (hello, my deeply unpopular Facebook post about cutting out flying!). Other times it abets learning. I was lucky enough to have an experience with the latter this week. I shared an article about Premier Doug Ford’s abominable decision to close the office of the Environmental Commissioner of Ontario. It’s a deeply regrettable move, telegraphing a lack of concern for the environment under the pretense of streamlining bureaucracy. But a friend who has worked in the Environmental Commissioner’s office for many years reached out to explain how this decision might actually play out positively. Overall, she’s optimistic that she’ll be able to continue her environmental work at the office of the Auditor General, and given the higher profile of the A-G, perhaps be more effective than before. This is fantastic news. And I almost wanted to share it more widely. But the fear of nuance nags. Will people walk away thinking our climate-denying Premier is somehow doing good by the environment? This friend and I both agreed that perhaps it’s best to let the prevailing sentiment about our shuttered environmental accountability office remain as such. Because anything that gets people in our province mobilized to fight our Premier’s execrable environmental moves is helpful right now. Mostly, the experience was a reminder of the bluntness of our communications tools. And my own reductionist/quickie/angry face emoji shares. I resolve to take a little more time to contextualize why I’m sharing something, and what I really think about it. At the very least, I’ll source a GIF that better reflects my thoughts on the content I’m sharing. I’ve “met” a few amazing menders through Instagram. Not a sentence I’d have imagined myself writing a decade ago. But the threads of connection on social media have implications on how I live my life, even though the mending Instagrammers are scattered all over the world, and even though we’ll likely never meet. I ordered Katrina Rodabough’s book after connecting with her on Instagram. Her specialty is visible mending, or Sashiko. You’re not trying to hide the fact that the item is mended, but instead to make beautiful work of it. It’s the denim equivalent of Kintsugi, the gorgeous Japanese art of repairing cracks in pottery with gold lacquer. I like visible mending both because it doesn’t try to hide the fact that a garment has been worn and loved and tended to, and because I’m a remedial seamstress and can never convincingly hide my repairs anyway. But what does any of this have to do with climate moods? A ton, actually. 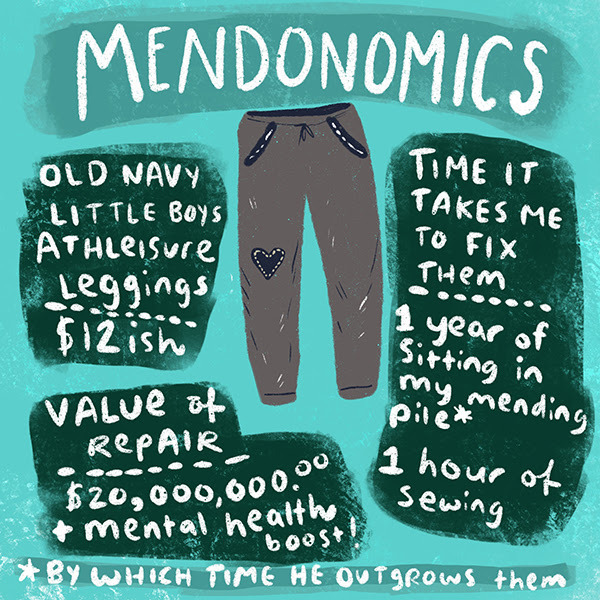 Mending takes time, and the economics often don’t add up. I’ll spend an hour sewing up the knees on a pair of $8 kiddo leggings. But the art of the fix is surprisingly satisfying. I hosted a mending night a few years ago, and with the aid of a few Singer ringers, everyone went home with a handful of restored garments, a deep sense of contentment, and a lot of cheese. Often, my mending piles sit for a year so when I literally close a loop, I get the kind of tactile satisfaction that’s analagous to crossing off TO-DO list item with a thick red marker. While mending was absolutely necessary just two generations ago, these days actually taking the time to fix what’s broken can feel downright countercultural. Manufacturers essentially strong-arm us into disposing what ought to be fixed. Supply chains are one-way streets! 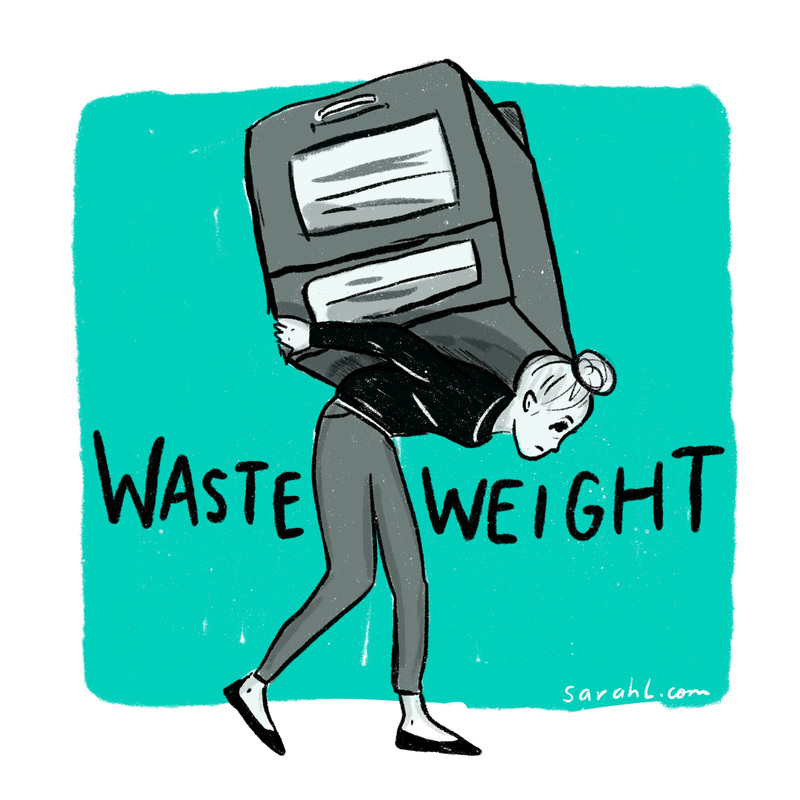 Fighting the throwawayness of it all is both tiring and emboldening. But more on this in next week’s newsletter! We know that knitting and crafting are great prescriptions for combatting anxiety, so it makes perfect sense that mending should be likewise. I really do feel as if I’m healing something when I mend, and I don’t just mean the ^ athleisure leggings from Old Navy that I’ve clumsily restored to working order. When I was a kid, I complained my way through Hebrew School. In one of our classes, we had a workbook that featured a cartoon picture of the world with a Band Aid on it. The workbook was all about the Jewish concept of Tikkun Olam, which literally translates to repairing the world. I think of this crudely drawn cartoon all the time, its message successfully imprinted on my brain at the age where things imprinted on your brain stick around and become part of your worldview. And I’m thankful for this slightly anthropocentric mindburn of an image. Because I am literally trying to Band-Aid my small corner of the world. 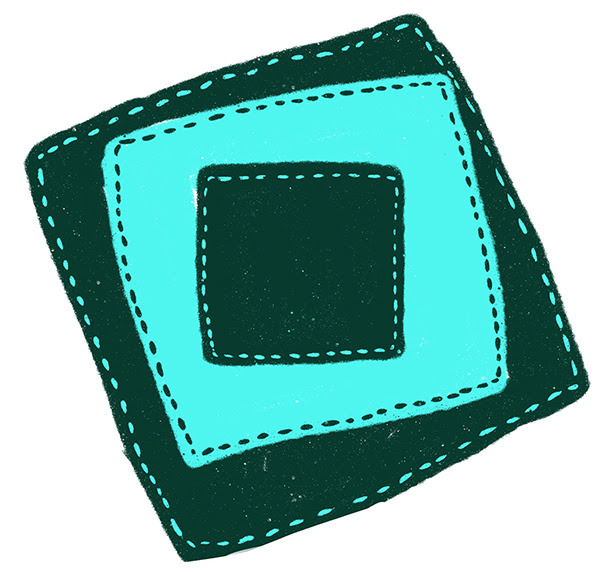 And because my mending is about as pretty as a Band-Aid.